How do you get from consideration to purchase? From visit to conversion? To explore how marketers in all industries can improve conversion, this week we analyze data from one specific industry showing how vacation booking methods are being considered and used. Read on to see how a marketer in any industry can use this data to increase purchases and other conversion actions from customers who interact with your brand. Plus, if you’re in the travel industry, you’ll enjoy this closer look at the behavior of premium travelers. To overly simplify the marketing of every product, B2B or B2C, high consideration or low, most marketing focuses on two options. Your brand can either be the (perceived) low-cost leader or the (perceived) high-value leader. Those are your levers. Cost and value. However, there is a third. If your brand can’t win over customers with either cost or value, you can create a systemic reason for customers to make a purchase. Which of the following did you consider for planning any of your vacations? Select all that apply. Which vacation service provider did you use to book your vacation? The survey focused on the premium travel market — people earning $100,000 or more who had booked a vacation in the past year. Vacation was defined as booking a flight and any one or more of the following: hotel, cruise, resort, flight, tours and car rental for a minimum of a 5-night stay for personal travel (not business). Let’s look at some specific lessons for the travel industry, but then we’ll end with the big picture meaning for all marketers. More than half (59%) of premiums travelers considered online travel agencies (OTAs) when booking a vacation, while 42% used OTAs (e.g., Expedia, Orbitz, Priceline, etc.). 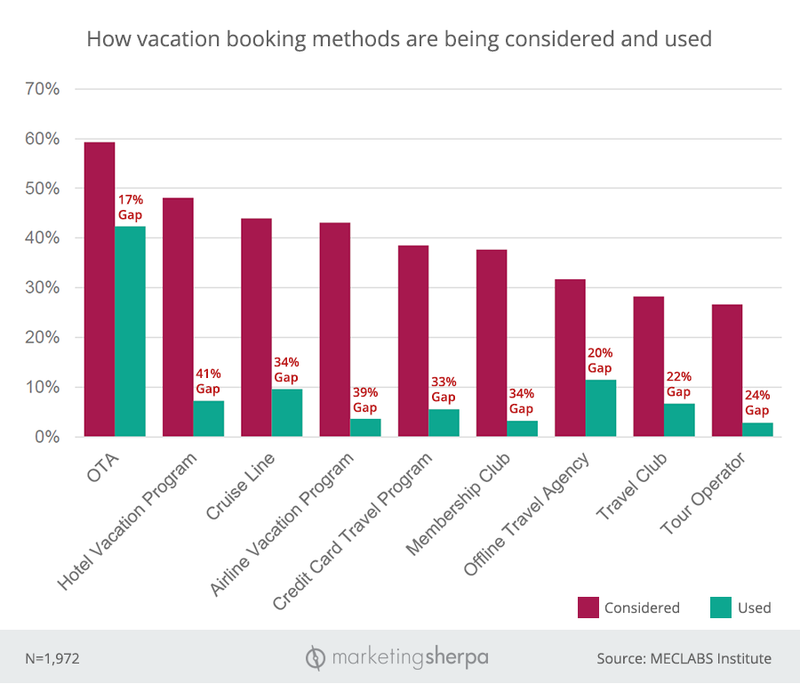 The gap of 17% between consideration and usage was the smallest among any of the vacation booking methods. We also asked respondents the primary reason for choosing the provider they chose. The top reason for OTAs, chosen by 22%, was that OTAs provide the best deal. “The frequency of consideration for non-OTA methods ranged between 48 to 27 percent. This is not bad, considering the heavy competition from OTAs,” said the lead researcher on the study, Gaby Paez, Associate Director of Research, Conversion Group, MECLABS Institute. While other booking methods were not as far behind OTAs for consideration, they lagged far behind for booking, with the closest competitor being offline travel agencies, showing there is still value in the human touch. “According to the results of the study, offline agencies have been able to target their prospects well and foster their loyalty; ‘easy to work with’ and ‘used them before’ were the most common reasons for using offline travel agencies,” Paez said. For online and offline travel agencies, booking travel is their core business. However, for hotel and airline vacation programs, travel booking is a brand extension. “The gaps show us that hotels and airlines have been able to build good awareness for their vacation programs but are lacking the ability to convince prospects they are a better option than OTAs,” Paez said. As mentioned above, online travel agencies had the smallest gap between consideration and usage. And the top reason people had booked on those sites was that OTAs (were perceived to) provide the best deals. As a company, if you can compete monetarily (in other words, generate high enough margins to be profitable) while being perceived as having the best deals, that is a very successful position for your brand. However, this is not possible for many brands. Many B2C companies can’t undercut Amazon or Walmart, and many B2Bs cannot sell cheaper than overseas, outsourced competition or open source software. And even perhaps when they can, customers do not buy the product based on the actual deal. It is the perception that a certain brand offers the best deals. So, for example, a customer may not price shop between Toys R Us and Walmart, they may simply go to Walmart, assuming it has the best deals even though it’s prices may, in fact, be more expensive. But if you can’t compete on price, you must compete on value. While offline travel agencies were lower, in terms of consideration, they were able to garner more conversions from those considerations than any other booking method, except the online travel agencies. This suggests that their ideal customer went to offline travel agencies not because they were expecting the best deal, but because they were expecting a certain amount of value. And the offline travel agencies delivered that value, thus getting those conversions. From another question in the survey, we know the top reason customers chose to book through offline travel agencies was that they were easy to work with. So, in other words, offline travel agencies are able to capture a segment of the market not focused on price, by offering additional value. Let’s also look at the impact of an overall system, as well. Hotel vacation programs generated the second-most consideration. They might have been helped in achieving that consideration because of the familiarity customers already have with the hotel brands. However, they had the largest gap between consideration and purchase, suggesting that the brand might have been enough to draw in curious shoppers, but most shoppers did not see enough value or low enough cost to convince them to purchase. They did, however, get some conversions. The top reason customers bought? The vacation program allowed them to use miles or points. This is a great example of using a systemic advantage to achieve conversions. In this case, it’s not enough of an advantage to lead the market, however. Unlike OTAs and offline travel agencies, vacation programs are not the main business, so the systemic advantage might be enough to still create a nice amount of additional revenue without heavy investment. So where does your brand fit into the mix? If you have a legitimate claim to be the low-price leader, use your marketing to ensure your customers perceive that pricing advantage. Selling at a low price is only advantageous if your customer perceives it. If you can’t sell for less, give your customers more. Communicate clearly that extra value customers receive from buying from your brand instead of the low-price leader. As you can see with offline travel agencies, this doesn’t mean you must attract every possible customer. However, if you attract the right customer in the right way, and they perceive that value, you will get conversions from many of the customers you attract. Lastly, is there any systemic advantage you can utilize? In some industries, the systemic advantage is so strong that cost and value have much less impact on the conversion. These industries tend to have monopolies or oligopolies, like electricity or internet service providers. Sometimes the systemic advantage is smaller but can still play a role. You might have a product in a larger B2B company that can offer a more end-to-end solution, instead of the point solution of a competitor. Or it might be the bricks-and-mortar locations that allow a retailer to deliver a product faster or less expensively. As you’re planning your marketing for 2018, look at your cost, value and systemic advantages, and make sure they are clearly communicated in your value proposition.